To extend the life and performance of the engine, it is necessary to maintain the vehicle's cooling system. The only purpose of the cooling system is to remove heat from the engine. It rejects heat from the engine to the air to prevent the car from overheating. When your engine burns gasoline, what is not used as mechanical energy to drive the car turns into heat. While a part of the heat is released through the exhaust pipe, a large part remains in the engine. Your engine will be destroyed without a cooling system. Radiator - as the main element of your cooling system, the radiator is located behind the front grill of the car. The hot coolant is passed through a series of ribs and pipes that help dissipate heat from the liquid into the air. 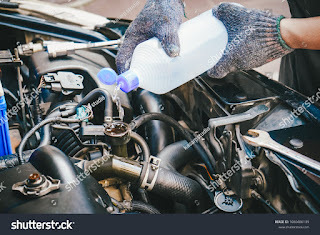 It then pumps the coolant back to the engine block when it reaches the right temperature. Radiator cap - The radiator cap maintains the pressure in the cooling system. If the pressure reaches a higher value than the set pressure point, the spring valve will release additional pressure. 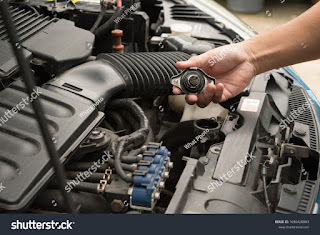 Thermostat - usually located in the upper, front part of the engine in the chamber, which is also the point of connection of the upper radiator hose. The thermostat is a valve that measures and regulates the flow of coolant to the engine. This ensures that the coolant has an optimum temperature before opening to allow coolant to flow to the cooler. Water pump - Typically located on the front of the cylinder block, the water pump is a device that keeps the coolant in motion as long as the vehicle's engine is running. Fan - You can find one or two radiator fans mounted on the back of the radiator on the side closer to the engine. The task of the fans is to ensure air circulation through the radiator when you are either stopped when the engine is running or driving slower. If the fans are not in place, the engine temperature will increase each time you stop. Coolant - the coolant passes through your cooling system. Although coolant occurs in many formulas and colors, the most common cooling agent in today's vehicles is a mixture of 50% antifreeze and 50% water. Refer to the user manual for the model that is recommended by the vehicle manufacturer. Many cooling fluids contain anti-corrosion and rusting additives that help prevent damage to the accumulation and cooling system. Visual inspection - During the inspection, the mechanic will look closely at the hoses and strips. They will check the hoses for cracks or cracks. They will also make sure that there are no swelling or bulging at the ends of the hose. If something looks like, the hose should be replaced. In newer vehicles, the water pump is driven by the timing belt. The timing belt usually has a fixed lifespan, which must be replaced at the end to make sure it will not fail. Checking the user manual and keeping accurate repair records will help you and your mechanic to make sure it is done when it should. The timing belt is inside the engine and can take a long time. For this reason, the water pump will be replaced with a belt, because most of the work to remove it and replace it has already been done. Pressure cooler bottle test - this test allows you to quickly check whether the cap is doing its job. A properly operating nut should maintain the nominal pressure for a maximum of two minutes. If it's time to replace the cap, make sure it has been replaced with one that has been made for your vehicle. Thermostat control - this check is to check the correct opening and closing of the thermostat, making sure that it regulates the flow of coolant. Pressure test - this test is carried out to locate any external leakages in the cooling system; including cooler, engine coolant canals, water pump, heater core and hoses. Internal leak test - this test is to check the leakage of gas to the cooling system. If you notice that the vehicle is losing coolant without traces of leakage, it is possible that you have a head gasket being blown out. It is best to diagnose it on the basis of the burner test on your heater. This test is performed using a block tester, which is a kit that performs a chemical test on the fumes in your heater. Engine fan test - this test will check if the fan (s) is working properly. You will want to check the fan if you notice that the engine temperature rises shortly after the vehicle stops. Power Flush System - You can replace the old coolant by emptying it and then refilling it with fresh coolant, but it is recommended to completely rinse the system at least every two to three years. (Check the user manual to see if it meets the specific requirements of the vehicle). Rinsing the system will remove not only the old coolant, but also any sediment and scale. For rinsing with energy, a special device is required, which can be found in car garages that offer this service.